I am seconds away from finishing my first London Marathon. I am 18. I have discovered the ambiguity of walls. I am suffering, limping to the finish line. Suddenly, a grey streak passes my right shoulder. I am being overtaken by a Womble. I have no energy to respond. I watch the Womble charge into the distance, arms madly aloft. Galvanised, I become a better runner, far beyond the reach of Wombles. And so I am embroiled in the final stages of a five-mile pre-Christmas race in Blackpool. It is a fancy dress affair. My costume stretches to a red hat. Up the road is a Christmas pudding, albeit a Christmas pudding running five miles in 29 minutes. He is gone, nonetheless. I will not catch him. I had better pull out, I reason. Or feign injury. I carry on. ‘You do know,’ my watching mother-in-law informs me soon after, ‘that you were beaten by a Christmas pudding?’ Indeed, she reminds me of this every Christmas. And this is my running career: a bridesmaid to a Womble and a Christmas pudding. Perhaps they should race? This all may seem tangential, but what I am saying is, I know how you feel. I can empathise. I understand the ignominy of being outrun by the metaphorical Womble. But I am now doing it to you. Getting my own back. Lots of us are. 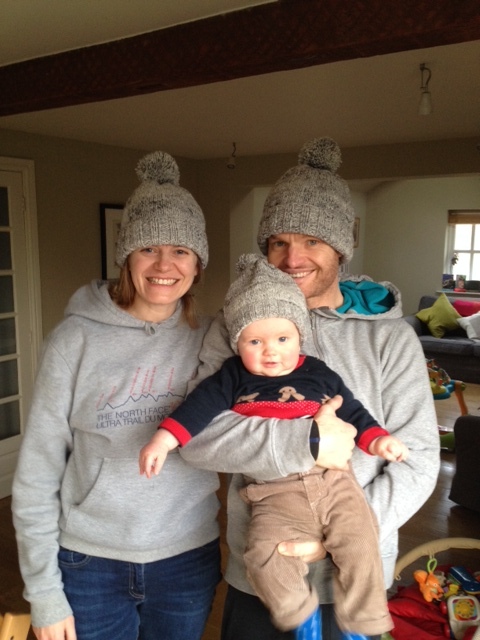 We are multiplying, cascading to parkruns and races. And we are chasing you down. And we mean business. The records are eye-watering. The fastest 10k with a buggy was set by New Zealander Dougal Thorburn who clocked 32 minutes, 26 seconds. The swiftest buggy marathon time is arguably even more impressive. Racing at the Route 66 marathon in the United States in 2009, Zac Freudenberg ran a startling two hours, 32 minutes, 10 seconds, while pushing his 10-month-old son. 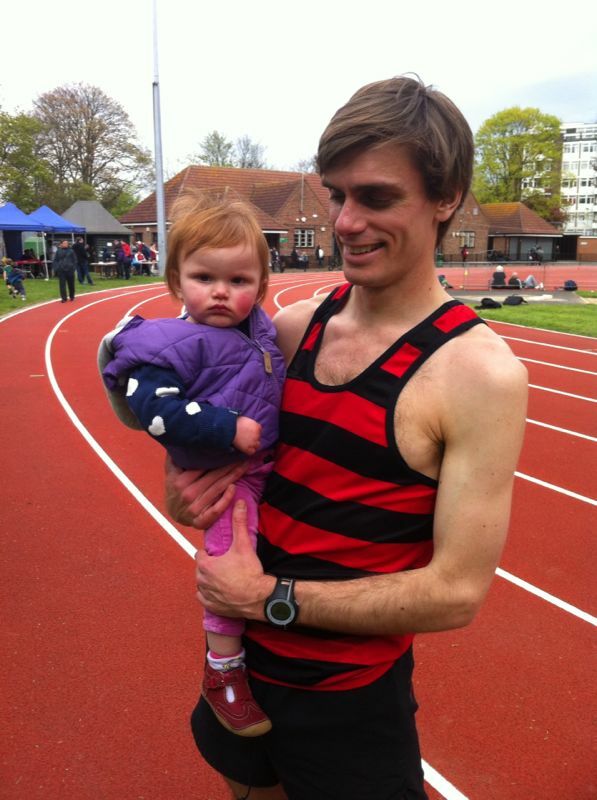 Behind him was ultra-runner and dad Mike Wardian, who clocked two hours, 34 minutes, 37 seconds, with his 11-month-old boy as a passenger. My daughter was four months old when we embarked on our first run. 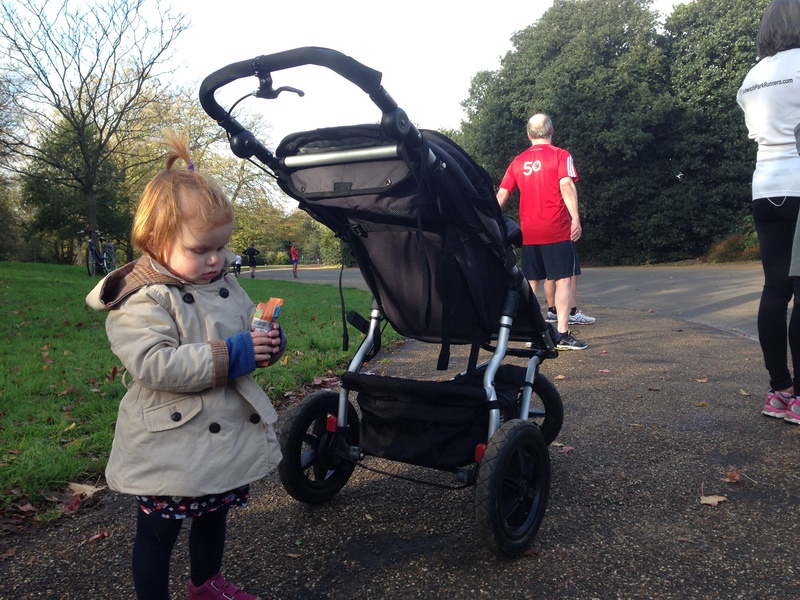 I laboured around Tooting Bec Common, knocking off eight-minute miles, while I – a typically paranoid new parent – regularly checked she was still breathing. We ventured out again and again, each time going a little faster, going a little further. The runs were unspectacular, dull affairs, though. I longed to be running at a proper pace. These were junk, ponderous miles. I was already a reluctant, almost embarrassed, buggy runner when my wife and I were repeatedly tut-tutted – or the Spanish equivalent – as we ran through the streets of Barcelona. And then everything changed. My wife was racing in Surrey one January morning. 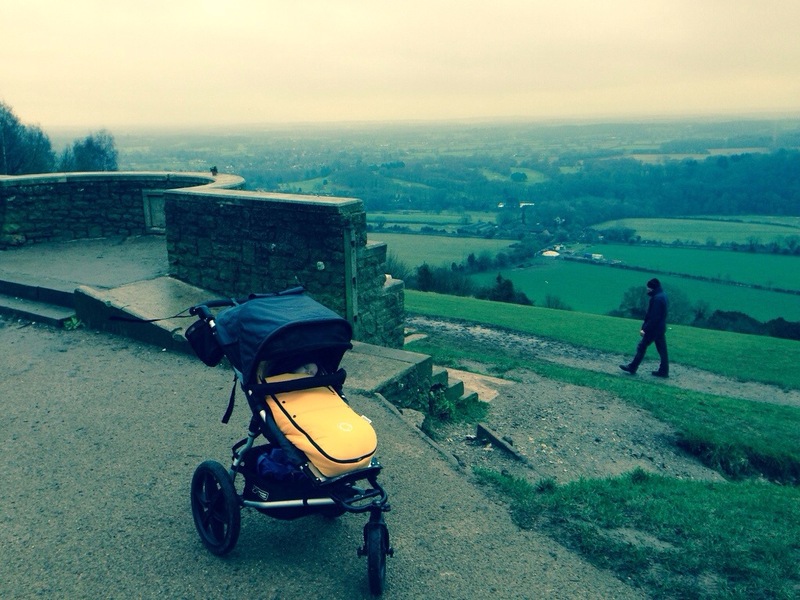 I was in a car park on Box Hill with a baby and a buggy and several hours to kill. Silenced by one of those ‘biscuits’ that babies devour but taste worse than cardboard, we set off down Box Hill’s zigzags of Olympics fame. We ran on the road. The notion seemed reckless at first, but if cyclists can ride two or three abreast, why can’t I irritate motorists too? That is something I would positively relish. We flew down that hill. In those couple of miles, I stopped caring what people thought about me and began to see the possibilities of running with a buggy. This was just a different sort of running, as fell is to road. We turned and began the ascent. There is only so fast you can run with a buggy. The reasons are obvious: wind resistance, weight, altered running style, and so forth. The biggest barrier to speed, however, is the fact that there is a limit to how daring you can be when careering a 10-month-old along a road without social services being alerted. There is a variable greater than anything I have already noted, however. A great fear. A great inevitability. She will wake. And when she wakes, she will want out of that buggy. I had been going close to 30 minutes when I began the ascent; I was already pushing my luck. I did not hang about. We did not catch a cyclist, frustratingly. Boy, did I try. We were close. One overtook us on the first zigzag, then slowed. We were gaining metre by metre, only for the rider to glance over his shoulder and – in recognising the potential shame of being passed by a baby being pushed up Box Hill in a buggy – got off his saddle and tried a bit harder. We went from to top to bottom in 15 minutes: a good effort even without a buggy. The baby had not even opened her eyes. She was still sleeping as I joined the queue in the summit cafe. As I paid, I tried to wake the baby. She would not stir. She was cold. My mind raced to an implausible catastrophe. I have killed her – somehow – by running up Box Hill. What will my wife say? What will the Daily Mail say? I prodded her cheek again. An eye lazily opened. ‘You’ve just run up Box Hill,’ I enthused when we were sitting down. Or when I was sitting down. She’d been sitting down the whole time. She seemed to shrug. Her eyes demanded yoghurt. She livened up after that. Getting a bit older helped. 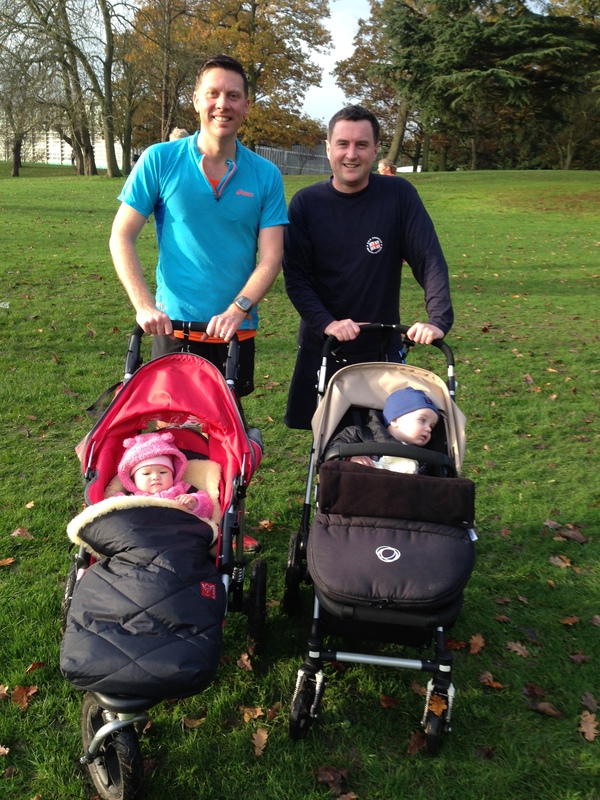 At our first parkrun – three flat loops around Dulwich Park – we easily ducked under 20 minutes. The following weekend, I tried, clocking 18 minutes, 24 seconds. We had started on the front line of runners; some of the locals did not like that. An enforced slow start meant were in about 30th place. One by one, we picked them off. Each time, my daughter would glance at the runner, casting a haughty, evil grin, before turning away nonchalantly. Midway in, we were cruising at sub-six minute mile pace, breaking into the top-10. I had been racing all year, without really enjoying racing. Being the underdog, the guy with the buggy – and being slower as a consequence – was unexpectedly transformative. Beyond the rough and tumble of racing, however, is the simple opportunity for a connection between father and child, a relationship sometimes deliberately, sometimes accidentally, diminished by society. And me? An unlikely metamorphous into a figurative Womble is complete. Role of honour: 5km in 19.49. Furthest non-stop training run of 22.4km in two hours. Do we need to call social services? We are always especially careful around road crossings and I am always very mindful of other runners’ heels during organised events. 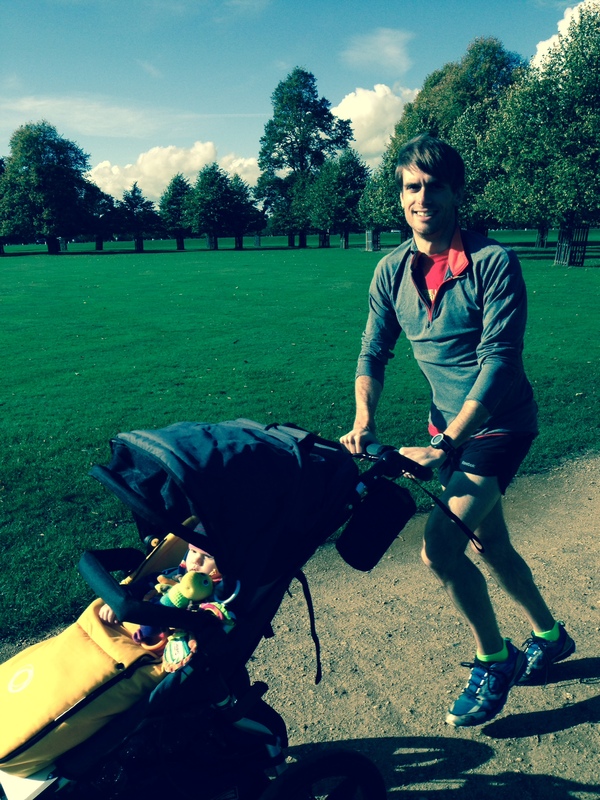 The world of a buggy runner: Non-runners just don’t get it at all. Quite often I run past people as they stare in disbelief. I’m not sure if that is a sign of disapproval or just shock that someone is putting themselves through the act of running and pushing a buggy at the same time. Role of honour: Sub-21 minute (just) parkrun. Do we need to call social services? For new year we escaped to Wales and I took the buggy out with my daughter wrapped up really warm in -4C conditions. It was very icy and a 1.5km downhill, dropping 850ft, saw me skating behind the buggy in my racing flats with no grip for most of it. 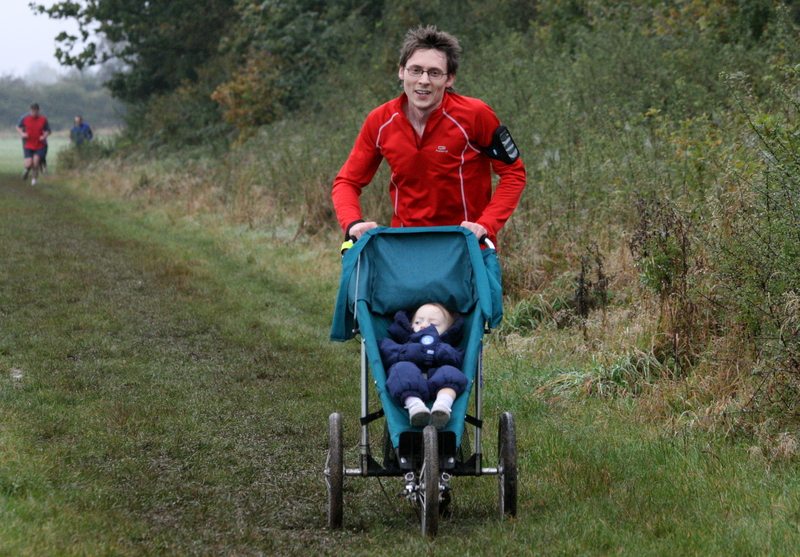 The world of a buggy runner: There is always a warm glow and extra shot of adrenaline through the arteries when overtaking non-buggy runners, looking at the horror in their faces as you accelerate to six-thirties with an extra 20kg of weight and so much extra wind resistance on the last lap of parkrun. Role of honour: Runs ranging from five to eight miles in South Lakes, often with a height gain of 1,000ft. The world of a buggy runner: At first this was a way to get the boy to sleep but now as he gets older he loves the speed as we whizz through the lanes and paths and he is on the lookout for sheep and cows in the fields.